In the 90s, the human papillomavirus (HPV) was designated an oncogenic virus following the demonstration of its DNA in cervical cancer from many countries around the world., Over hundred HPV types have been identified of which forty infect the genital tract primarily through sexual transmission. Of the many serotypes of HPV DNA identified, those of HPV types 16 and 18 were found to be predominate though studies have shown some variation in the serotypes among different populations., Despite, the high incidence of cervical cancer in Nigeria, there are only a few large-scale population-based studies on HPV prevalence and genotype distribution reported from this region and none in archival cervical cancer samples.,, The aim of this study is to elucidate the prevalence of high-risk HPV as well as to elucidate the types found in archival specimen from cervical cancer cases diagnosed in some centers from the South-West of Nigeria between 2000–2004. This study is a part of a larger study by the RIS HPV TT study group whose objective was to describe the HPV genotype distribution in (ICC) worldwide. The study design was a cross-sectional period-prevalence study on archival specimens. Paraffin-embedded tissue blocks of ICC were consecutively selected from the three participating laboratories in South-West Nigeria. Cervical cancer cases diagnosed between 2000 and 2004 were identified. Basic information (age at diagnosis, year of diagnosis, and original histopathological diagnosis) were also collected from the medical records. Blocks were reembedded wherever necessary. At least four paraffin sections were obtained for each block (sandwich method). First and last sections were used for histopathological evaluation after hematoxylin and eosin (H and E) staining. The in-between sections of the blocks were kept in eppendorf tubes for HPV DNA testing. Paraffin-embedded blocks were processed under strict conditions to avoid potential contamination. A tissue-free paraffin block was cut after processing each study block to prevent any HPV carryover from block to block. For each block, a new blade was used and the microtome was cleaned with Histoclear II and 70% alcohol. To further control for possible sources of contamination, the paraffin blocks containing nonHPV-related lesions processed at the same time as the cervical cancer specimens in the local pathology lab were blindly included in the process at a ratio of 5% per ICC samples. These specimens were labeled as controls. The paraffin blocks processing and the pathology reassessment of the histopathological diagnosis was done by the reference pathology laboratory (Institut Català d'Oncologia (ICO), Barcelona and was performed following the consensus criteria established by an expert panel of pathologists based on the World Health Organization classification of the uterine cervix tumors. The pathology evaluation included: diagnosis of histological type (ICC: squamous cell carcinoma, adenocarcinoma, adenosquamous carcinoma, other types; noninvasive cervical cancer and control tissue specimen); the presence of mucosa or preneoplastic lesions adjacent to ICC (Cervical intraepithelial neoplasia-CIN1/2/3; Adenocarcinoma insitu (AIS)); degree of necrosis; amount of tumor infiltration; and adequacy of the sample for further HPV testing. A block was determined to be adequate for HPV testing, if invasive cancer was observed in the two H and E stained sections of the specimen. In case of discrepancies between the local and the reference laboratories, the results obtained at the reference lab prevailed. This was done using the methodology outlined by Kleter et al. 250 μl of freshly prepared Proteinase K solution was used to extract the DNA. SPF-10 PCR was performed using 10 μl of the DNA extract in a final reaction volume of 50 μl. All samples were run with a 1:10 dilution. The amplified PCR products were tested using a probe hybridization with a cocktail of conservative probes recognizing, at least, fifty four mucosal HPV genotypes in a microtiter plate format for the detection of HPV/DNA. Optical densities (OD450) were read on a microtitre plate reader. HPV/DNA positive samples were subsequently analyzed by HPV SPF-10 LIPA25(version 1: Labo Biomedical Products, Rijswijk, Netherlands), a reverse hybridization technique that detects twenty five high-risk and low-risk HPV types (6, 11, 16, 18, 31, 33, 34, 35, 39, 40, 42, 43, 44, 45, 51, 52, 53, 54, 56, 58, 59, 66, 68, 70, and 74). The sequence variation within the SPF-10 primers allows the recognition of these different HPV genotypes, except for types 68 and 73, as their interprimer regions are identical and cannot be distinguished by this test. After PCR, 10 μl of the amplimers were used to perform reverse hybridization for HPV genotype identification. Positive hybridization on the strips is visualized as a purple band by means of a precipitating color substrate on the probe site. Specimens that were HPV/DNA positive but did not hybridize with any of the twenty five probes were coded as HPV type X (uncharacterized type). SPF-10 LIPA25 PCR detection and typing analysis were performed at ICO. Data analysis was performed with the Statistical Package STATA 10. Overall, HPV positive and HPV type-specific proportions were determined. 95% Confidence Intervals (95% CIs) for proportions were estimated. To estimate the HPV type distribution, single and multiple HPV infections were considered either separately or combined. A stratified analysis of the overall HPV positivity by age at diagnosis and histological characteristics was performed. Age at diagnosis was recoded as a categorical variable (age: ≤39, 40–49, 50–59, and ≥60 years). Specimens were received anonymously (without name and/or original medical record number) at the reference laboratory in Barcelona (ICO). All protocols were approved by international and ICO ethics committees and all the study progress was overseen by an international steering committee specifically formed for the supervision and advising in critical issues of the project. There were two hundred and thirty five histologically diagnosed carcinomas of the cervix seen during the period of study. Of the 187 samples considered appropriate for HPV detection after histological evaluation, there were 173 squamous cell carcinomas, 9 adenocarcinomas, 2 adenosquamous carcinomas and 3 neuroendocrine carcinomas. Data on age were available for 155 cases, and the age range was from 22 to 86 years with an average age incidence of 55.1yrs. The number of cases increased from the 3rd decade with a peak in the 6th decade. 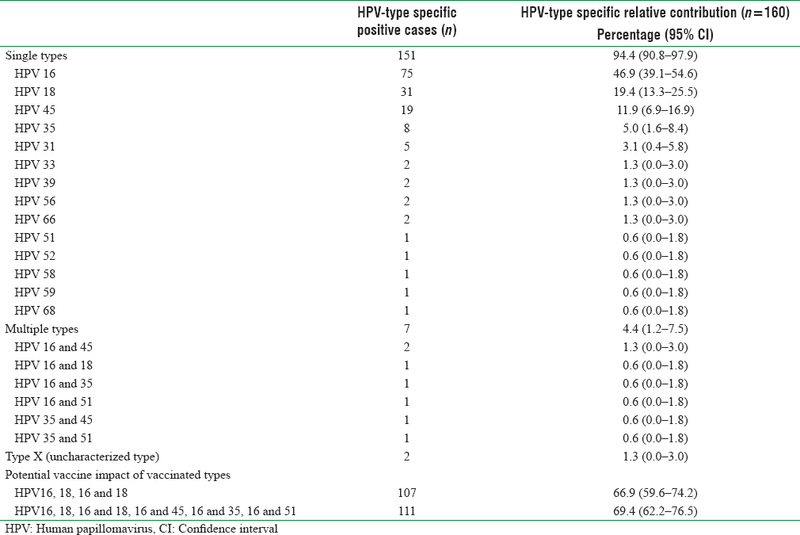 One-hundred and sixty cases (85.6%) were positive for HPV DNA [Table 1]. Among the HPV DNA positive cases, a single HPV type was identified in 151 cases (94.4%; 95% CI: 90.8%–97.9%), type X in two cases (1.3%; 95% CI: 0%–3.0%), and multiple types in seven cases (4.4%; 95% CI: 1.2%–7.5%). The five most common single types among positive cases were: HPV16 (46.9%), HPV18 (19.4%), HPV45 (11.9%), HPV35 (5.0%), and HPV31 (3.1%) [Table 2]. In all seven multiple infections, two HPV types (double infections) were identified, five of which had type 16 in addition to another. All cases with multiple infections were squamous cell carcinomas. HPV16/HPV18 (HPV16 and 18 as single types plus HPV16and18) accounted for a 66.9% (95% CI: 59.6%–74.2%) of the HPV positive ICC cases, and this percentage reached 69.4% (95% CI: 62.2%–76.5%) when multiple infections of HPV 16 with another high-risk type were counted. HPV16 was the common type identified in squamous and adenocarcinoma cases, although there was more HPV18 in adenocarcinomas than HPV 16 [Figure 1]. It was identified either in single/multiple infection in 51.0% and 50.0% of the squamous and adenocarcinomas, respectively. HPV18 was found in two cases of neuroendocrine carcinomas, while HPV35 accounted for one case of neuroendocrine carcinoma. Both cases of adenosquamous carcinoma had HPV16 and 45. HPV was detected in 160, of the 187 cervical cancer cases analyzed giving an overall prevalence rate of 85.6%. This is high when compared the findings from Uganda by Odida et al. but low when compared to those of de Cremoux et al. and Peedicayil et al. who recorded prevalence rates of 96 and 95% from Italy and India, respectively.,, The lower prevalence from our studies may be attributable to use of unbuffered formalin for fixation of tissues in the selected laboratories. Most of the infections were due to specific HPV genotypes with mixed infections occurring in only 4.4% of cases. This is similar to the findings of Odida et al. from Uganda and el-All et al. from Egypt, who also reported an association with Bilharzial infection., It is however low compared to the findings from Italy, France, and Zimbabwe where mixed infections were found in 18, 22.2, and 24% of cases, respectively.,, Both types 16 and 18 were found in ≥50% of the mixed infections. Differing data on the frequency of coinfections with multiple HPV types detected in cervical neoplasia have been attributed to the typing methodology and population studied. Sebbelov et al. found that infections with multiple genotypes were prevalent in Alaskan (36.5%) but not in Greenland natives (3.7%) and Danish caucasians (6.9%). Multiple infections have been found to have an impact on treatment outcomes. Munagala et al. in their study on the significance of multiple HPV infection in cervical cancer patients and its impact on treatment response found multiple infections to be particularly associated with HPV types 58 and/or 18. These were associated with the risk of treatment failure and therefore had to be followed up for response and suitable interventions done for a favorable outcome. Multiple infections have also been found to be associated with increased cervical cancer risk. Regarding HPV type distribution, the recent reviews have confirmed that HPV16 is consistently the most common type of HPV in cervical cancer and HPV18 the 2nd common with some minor geographical differences. This corresponds with a recently concluded metanalysis which found HPV types 16 and 18 to be the most common among African women. Studies have demonstrated a predominance of HPV16 in invasive squamous cell carcinomas and HPV18 in adenocarcinoma though the proportions may vary., This was not the finding in this study, where HPV16 was still the dominant type in the adenocarcinomas (50.0%) with both types 18 and 45 equally represented. A study in Colombia, South America attributed 93% of adenocarcinoma cases to HPV types 16, 18, and 45. Specific types of HPV were not identified in two cases (type X). Similar findings have been reported from Uganda where there were five cases that could not be specified. The authors raised the possibility of unidentified HPV types being present in the sample. Studies from the Northern part of Nigeria also confirm the high prevalence of HPV types 16 and 18 in cervical cancer cases. 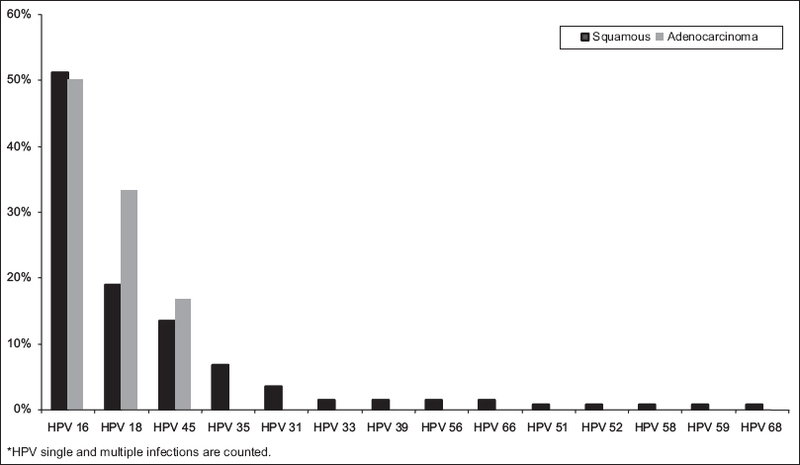 The prevalence of HPV DNA in archival samples of cervical cancer from South-West Nigeria is 85.6% supporting its role in the etiopathogenesis of cervical cancer in this region. HPV16 and 18 are the common types and account for about 70% of cases supporting the fact that vaccination against these two types will prevent at least 70% of ICC. A 3rd of the invasive cancers are not associated with HPV16/18 indicating that screening for cervical neoplasia should be maintained after prophylactic vaccination against these types. HPV 18, while found to be dominant in the neuroendocrine carcinomas is not the dominant type in the adenocarcinomas as reported from most parts of the world. HPV type 45 is highly prevalent in invasive carcinoma and therefore it is recommended that future vaccines should be tailored according to local HPV type distribution. International Agency for Research on Cancer. Monographs on the evaluation of carcinogenic risk to humans. Human Papillomaviruses. Vol. 64. Lyon: International Agency for Research on Cancer; 1995. Bosch FX, Manos MM, Muñoz N, Sherman M, Jansen AM, Peto J, et al. Prevalence of human papillomavirus in cervical cancer: A worldwide perspective. International biological study on cervical cancer (IBSCC) study group. J Natl Cancer Inst 1995;87:796-802. Chauhan SC, Jaggi M, Bell MC, Verma M, Kumar D. Epidemiology of human papilloma virus (HPV) in cervical mucosa. Methods Mol Biol 2009;471:439-56. Franceschi S, Herrero R, Clifford GM, Snijders PJ, Arslan A, Anh PT, et al. Variations in the age-specific curves of human papillomavirus prevalence in women worldwide. Int J Cancer 2006;119:2677-84. Schnatz PF, Markelova NV, Holmes D, Mandavilli SR, O'Sullivan DM. The prevalence of cervical HPV and cytological abnormalities in association with reproductive factors of rural Nigerian women. J Womens Health (Larchmt) 2008;17:279-85. Tavassoli FA, Devilee P, editors. World Health Organization classification of tumours. Pathology and Genetics of Tumours of the Breast and Female Genital Organs. Lyon: IARC Press; 2003. Kleter B, van Doorn LJ, ter Schegget J, Schrauwen L, van Krimpen K, Burger M, et al. Novel short-fragment PCR assay for highly sensitive broad-spectrum detection of anogenital human papillomaviruses. Am J Pathol 1998;153:1731-9. Odida M, de Sanjosé S, Quint W, Bosch XF, Klaustermeier J, Weiderpass E, et al. Human papillomavirus type distribution in invasive cervical cancer in Uganda. BMC Infect Dis 2008;8:85.
de Cremoux P, de la Rochefordière A, Savignoni A, Kirova Y, Alran S, Fourchotte V, et al. Different outcome of invasive cervical cancer associated with high-risk versus intermediate-risk HPV genotype. Int J Cancer 2009;124:778-82. Peedicayil A, Abraham P, Sathish N, John S, Shah K, Sridharan G, et al. Human papillomavirus genotypes associated with cervical neoplasia in India. Int J Gynecol Cancer 2006;16:1591-5.
el-All HS, Refaat A, Dandash K. Prevalence of cervical neoplastic lesions and human papilloma virus infection in Egypt: National cervical cancer screening project. Infect Agent Cancer 2007;2:12. Del Mistro A, Salamanca HF, Trevisan R, Bertorelle R, Parenti A, Bonoldi E, et al. Human papillomavirus typing of invasive cervical cancers in Italy. Infect Agent Cancer 2006;1:9. Prétet JL, Jacquard AC, Carcopino X, Charlot JF, Bouhour D, Kantelip B, et al. Human papillomavirus (HPV) genotype distribution in invasive cervical cancers in France: EDITH study. Int J Cancer 2008;122:428-32. Stanczuk GA, Kay P, Sibanda E, Allan B, Chirara M, Tswana SA, et al. Typing of human papillomavirus in zimbabwean patients with invasive cancer of the uterine cervix. Acta Obstet Gynecol Scand 2003;82:762-6. Sebbelov AM, Davidson M, Krüger Kjaer S, Jensen H, Gregoire L, Hawkins I, et al. Comparison of human papillomavirus genotypes in archival cervical cancer specimens from Alaska natives, Greenland natives and Danish Caucasians. Microbes Infect 2000;2:121-6. Munagala R, Donà MG, Rai SN, Jenson AB, Bala N, Ghim SJ, et al. Significance of multiple HPV infection in cervical cancer patients and its impact on treatment response. Int J Oncol 2009;34:263-71. Lee SA, Kang D, Seo SS, Jeong JK, Yoo KY, Jeon YT, et al. Multiple HPV infection in cervical cancer screened by HPVDNAChip. Cancer Lett 2003;198:187-92. Bosch FX, Burchell AN, Schiffman M, Giuliano AR, de Sanjose S, Bruni L, et al. Epidemiology and natural history of human papillomavirus infections and type-specific implications in cervical neoplasia. Vaccine 2008;26 Suppl 10:K1-16. Ogembo RK, Gona PN, Seymour AJ, Park HS, Bain PA, Maranda L, et al. Prevalence of human papillomavirus genotypes among African women with normal cervical cytology and neoplasia: A systematic review and meta-analysis. PLoS One 2015;10:e0122488. Sanchez GI, Bravo LE, Hernandez-Suarez G, Tous S, Alemany L, de Sanjose S, et al. Secular trends of HPV genotypes in invasive cervical cancer in Cali, Colombia 1950-1999. Cancer Epidemiol 2016;40:173-8. Wang KL, Yang YC, Wang TY, Chen JR, Chen TC, Chen HS, et al. Neuroendocrine carcinoma of the uterine cervix: A clinicopathologic retrospective study of 31 cases with prognostic implications. J Chemother 2006;18:209-16. Ishida GM, Kato N, Hayasaka T, Saito M, Kobayashi H, Katayama Y, et al. Small cell neuroendocrine carcinomas of the uterine cervix: A histological, immunohistochemical, and molecular genetic study. Int J Gynecol Pathol 2004;23:366-72. Grayson W, Rhemtula HA, Taylor LF, Allard U, Tiltman AJ. Detection of human papillomavirus in large cell neuroendocrine carcinoma of the uterine cervix: A study of 12 cases. J Clin Pathol 2002;55:108-14. Parwani AV, Smith Sehdev AE, Kurman RJ, Ronnett BM. Cervical adenoid basal tumors comprised of adenoid basal epithelioma associated with various types of invasive carcinoma: Clinicopathologic features, human papillomavirus DNA detection, and P16 expression. Hum Pathol 2005;36:82-90. Manga MM, Fowotade A, Abdullahi YM, El-Nafaty AU, Adamu DB, Pindiga HU, et al. Epidemiological patterns of cervical human papillomavirus infection among women presenting for cervical cancer screening in North-Eastern Nigeria. Infect Agent Cancer 2015;10:39.